What are your thoughts on the crop top? A look that’s cropping up everywhere (pun intended), I’ve seen the good, bad and the ugly. When worn tastefully the look is #chictothenexlev, but if worn too bare it borders on being skanky. I love a good crop-top paired with a high-waisted midi or pencil skirt or high-waisted pants. Throw a blazer over your shoulders to cover up some more. Blair, Mary and Kat have been killing it with cropped looks lately – don’t they look gorgeous? Shop some of my favorite crop tops below to recreate the look for yourself! This simple one is my favorite. PS – if Lela Rose (the epitome of ladylike glamour) is doing some crop tops for her pre-fall collection, you know it’s a trend that’s here to stay! I love it with something high waist otherwise it’s a no for me. I always wear mine with a midi or long skirt that goes above the belly button. Love a good crop top! Zara also has a ton of cute ones! Ooh that mint Alexander Wang option would be so great for spring! I got back and forth about if I could pull it off, I love it of course on models and on the runway. I definitely would wear it though with highwaisted full skirt. This is a great roundup! I’m a little hesitant about sporting a cropped top because my middle isn’t the most fit area of my body but I do love your picks! I love the look (most of the time) but I just can’t pull it off. That’s my trouble spot. But bring on the mini skirts! I like the trend, but it definitely has to be styled appropriately. Otherwise, its a no go. I really love the crop tops as long as there is just a sliver of skin showing. Any more and it is way too Britney Spears from 2001. I especially love them with a flared skirt to keep it balanced and polished. I like it in the summer but seems out of place in the winter. I agree with you – I like the summer hues better too for the look! I think I would need to tone up a bit before I try this trend, so I’m a little scared to try it! that jason wu number – swoon! Gahhhh, I am always so nervous to try a crop top. I love how you have them all matched with high-waisted skirts. May just have to experiment this weekend! Thanks for your comment on my blog. The cuff is my favorite piece too! It is pretty reasonably priced too! Love crop tops, but don’t know if I can pull them off;). I think they can still look classy if worn with high waisted bottoms. I will never ever ever expose my stomach. I’m self conscious yes but I also can’t stand the look. I don’t mind it so much when there’s just a sliver sticking out but when it becomes seriously cropped, I feel like it’s vulgar…. that may be just me! Can’t wait for warm weather to wear the crop top trend! They’re all such fit girls! I love it on them but am not sure I would be brave enough…need more than a little ab work before I’d consider it personally! Good thing it’s going to be around a while. I’m not necessarily “anti” crop top, but I think unless you have the right body type, there’s probably better things out there you can be wearing. I know I’m not comfortable wearing one, but I always think they’re cute in store. Its a reinvention of an old 50’s style turned 80’s style turned modern once again. I can’t wait to sport this look in the Spring and Summer. I am totally working on toning my abs to be ready!! 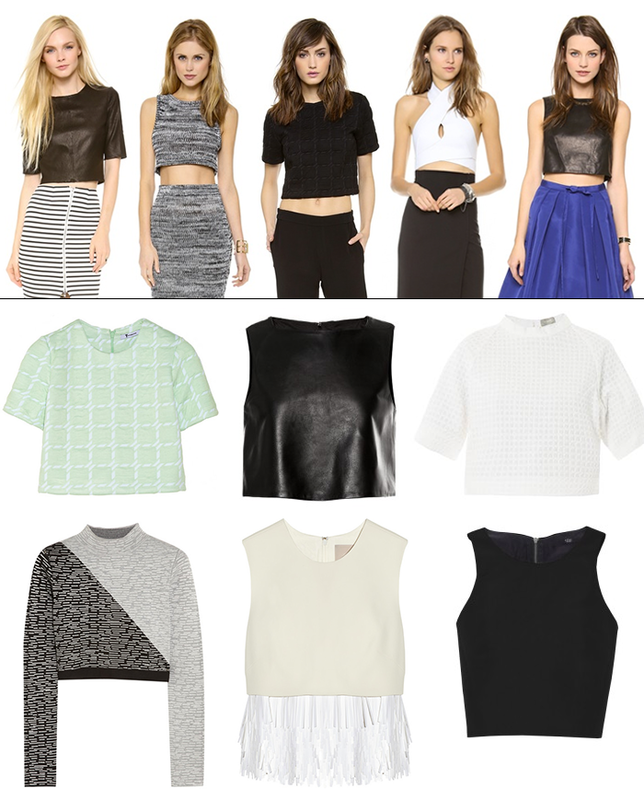 Loving the crop top trend, especially when it can be paired with a midi for that effortless look. Both the crop and the midi are a keeper!